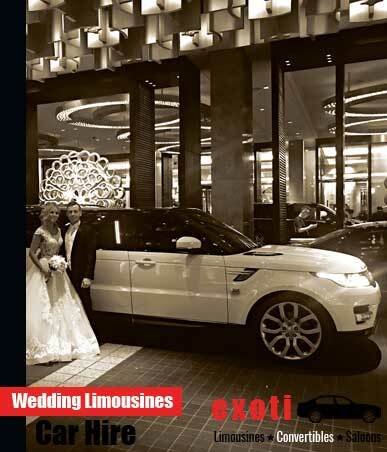 When it comes to modern Exotic Wedding Limousines in Melbourne, Exoticar Euro Luxury Hire has been the leaders in the Wedding industry from the very start. We built the first current Mercedes, Porsche and Now Range Rover Limousines in Australia.Actually, our Porsche limo(Porsche Cayenne) was the first of its series to be built as a limo worldwide and then we did it again with the all New Range Rover Stretched Limousine. Naturally, when it came to adding Chrysler Limousines to our fleet (Chrysler 300), we had to add the latest and newest with custom designed interiors with Jet Doors unlike any other Chrysler Limos out there. So if you are looking for wedding limo hire in Melbourne, look no further, then the experts in Wedding Limousines in Melbourne – Exoticar. When you deal with a company of our size, you’ll see we have different options to offer you in Brands, Colors and Seating capacity with the Service to match. At Exoticar Euro Luxury Hire, we are keen car enthusiast. We are the only limousine company that builds, hires and complies all our Limousines. All Wedding Limousines are company owned. So, come view our Porsche Cayenne Limousine in Black, our Range Rover Limousine in White and our NEW Shape Chrysler 300 Limousines with Jet Doors in Black or White. Our Chauffeurs, on the day are highly trained to make your day run smoothly. From the red carpet service, to the umbrellas in the limousines and the water, champagne and nibblie hamper, we exceed every couples expectations. Get in touch with us for more information on our wedding limousines in Melbourne. We have a few new Models in the development stage. So, come back and check often with our latest ideas and see how we can make your Wedding unique with our wedding limo hire in Melbourne. For an interesting, extraordinary and dreamlike experience of a lifetime, ensure you book a brilliant Limousine for your wedding day. Exoticar want you to encounter the most amazing wedding day, you can have, and we endeavour to do everything to fill your needs. A glimmering Limousine is an ideal backup to any exciting Wedding, including a fairy tale approach to movement, and all the more essential, to influence you to look the best groom or the best bride of the hour or prep around the local area. Be gotten from your home in our luxurious limousine, garnished with beautiful flowers, previously your own one of a kind Chauffeur will journey you gradually towards the service. The greater part of our Limousines are driven by qualified experts, who are glad to take you on an in style and safe way. Begin the immense day away from work with a glass of champagne, accessible from our complimentary bar section as you entertain yourself with the numerous highlights and surprises, our great Limousine brings to the table. Your Chauffeur will drive you to the service, after which, he will wait until the time of the function completes, to the point that he will drive you securely to the destination. So if you are searching for the ideal method to travel on your wedding day, look no further then Exoticar, it will give offer you the best limousine services.